Description: The spearhead has a leaf-shaped blade which is longer than the socket, and both being proportionately longer than Swanton type C1. The blade appears to have a thin profile, but curvature is difficult to determine due to the extent of corrosion. Below the blade the spearhead narrows into a short, solid neck before extending into a rounded, broadly cleft socket. The socket has snapped off along its length, likely half way along its length. The blade is lozenge shape in cross-section and bent slightly along its length. Measurements: 220mm long, 38.8mm wide, 15.63mm thick (at the shaft, blade 7.37mm thick) and 181.6g in weight. Discussion: Swanton (1974: 10) writes about Series C2 that "spearheads with this profile are found with associations indicating the widest possible range in time from the earliest settlements to the end of the seventh century". 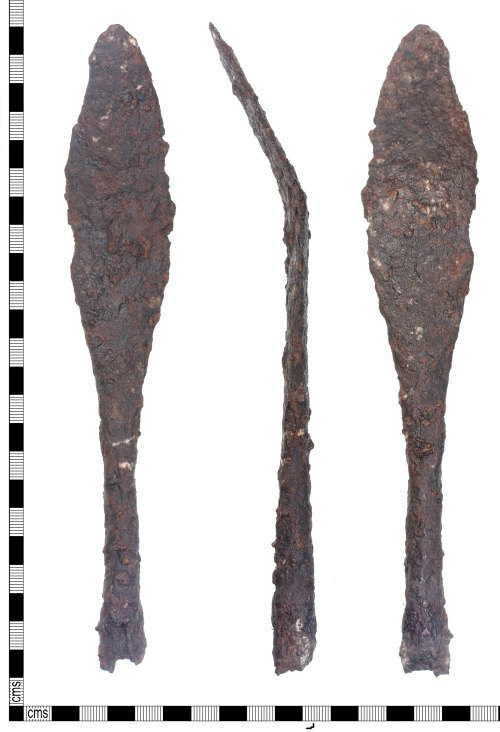 He adds that they are often found in elaborate 7th century burials, however the chronology for Anglo-Saxon grave goods has shifted markedly in the last 5 years (Bayliss and Hines 2013) and it is likely that the dates for such spear are late 5th century to 7th century in date.